The above pictures are of the front, rear, insides and expansion memory card from an Apple IIGS. The Apple IIgs was the last of the Apple II line, and the most powerful of the bunch. With a 2.8mHz WDC 65SC816 processor, up to 8MB of RAM and a stack of open slots for any kind of card you could stash in there, it was quite a piece of work. Introduced in 1986, the IIgs ran right into 1992 before the line was dumped. 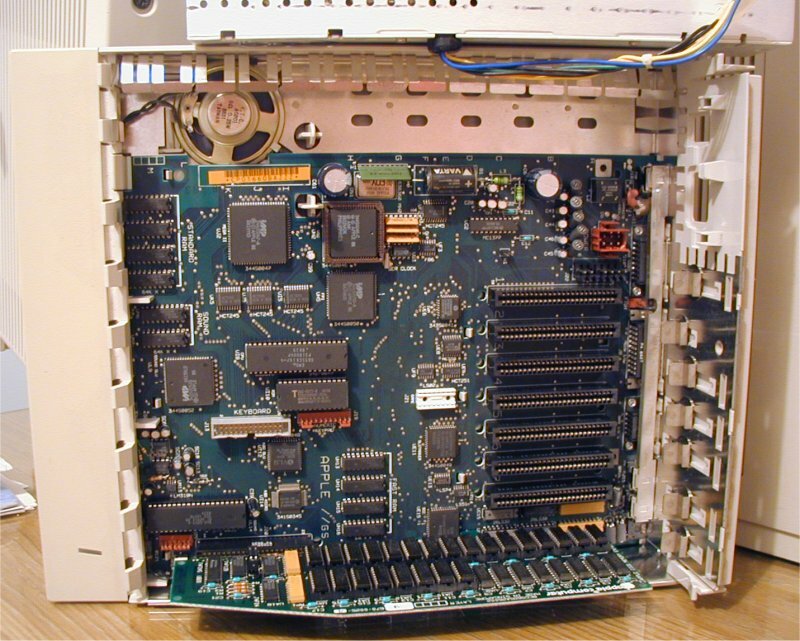 The IIgs supported the 5.25" or 3.5" (800k) drives, and with a SCSI card, even a hard disk. With a little bit of trickery, you can even make the IIgs "netboot" from another Apple using a LocalTalk cable!